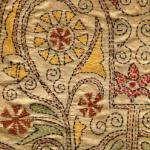 The art of decoration of fabric or other material with threads, wires or leather using a needle may be defined as embroidery. With the advent of sophisticated machines, embroidery is possible by machines also, especially for repetitive volume work. But, it is the hand embroidery that continues to fascinate mankind for thousands of years. Traditionally, women have been practicing this art from time immemorial. But in the last few decades, men have pickup tis craft in a big way. There are scores of embroidery stitches practiced by various communities lobally. Embroidered fabrics are not only used for apparel. It is widely used in furnishing and to create unique decorative pieces of art.